Everyone knows Rick Nash has the potential to be a great NHL player. When he came over to the Rangers via trade by the Columbus Blue Jackets he was already considered an elite scorer. However, he has been very streaky for the Rangers especially during the playoffs where he had only scored 4 goals in the past two seasons the Rangers were in it. Fans have been wondering if the Nash trade would end up being a bust. Nash silenced critics, at least for one night. On opening night Nash had 3 points (2 goals, 1 assist) to lead the Rangers to a victory over the St. Louis Blues. He looked like the player everyone had been asking for. He scored the first goal of the game and of the season with a nice takeaway and pass by Chris Kreider. 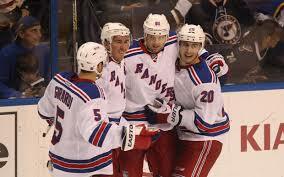 Nash then repaid the favor with a great pass to Kreider on a breakaway; Rangers were up 2-0 after Kreider’s goal. In the 3rd period tied 2-2, Martin St. Louis’ puck movement set up a great feed to Nash, who shot it in for the game winner. The Rangers came away with a 3-2 victory on the road over the Blues to open up the season. The Rangers looked to be over their Stanley Cup hangover. The defense broke up a lot of passes. Henrik Lundqvist was in rare form making 23 saves. The PK unit also played well as the Blues went 0-5 on the PP. There were some negatives in the game as well. We all know the problems the Rangers have with faceoffs, especially since Derek Stepan is on IR for the next month. The Blues led in faceoffs 31 to 25 over the Rangers. The Rangers also had a big loss on defense as Dan Boyle was hit and came out of the game. Coach Alain Vigneault said after the game that Boyle would miss 4-6 weeks with a broken hand. Expect the defenses minutes to go up. It was a great start for the Rangers as they look to improve upon their magical Stanley Cup run of last year. Next up, the Rangers head to Columbus to take on the Blue Jackets. Can Rick Nash have a repeat performance against the team that traded him to the Rangers? The Blue Jackets are also dealing with injuries so it will be nice to see how the Rangers handle this game. The puck hits the ice at 7pm in Columbus at the Nationwide Arena. The Rangers will follow that game with their home opener on Sunday against the Toronto Maple Leafs.